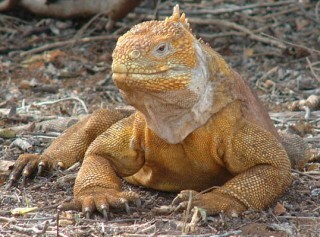 We've just gotten back from the most AMAZING tour around several islands in the Galapagos. We bussed across Santa Cruz to the airport, picked up a Swiss couple and a German couple (both quite young and unmarried) and continued down to the local harbor and out to the boat. Lobo de Mar III (literally: Sea Wolf, but actually their word for Sea Lion) is an 80' (25.5m) steel power boat with 3 levels. The top level (where our cabins were) has the pilot house and 4 double cabins, each with its own head and shower (but only single beds). We had to close off the AC vent, but otherwise the cabins were ample, although the hot water was funky. An electrical wall switch in the shower (!?!) controlled an electrical heating element in the shower head which sparked alarmingly and had 2 settings: too-hot and hotter, requiring us to take our lives in our hands to cycle the wall switch several times during a shower. But having hot water at all was a treat, especially after snorkeling in this cold water. At the back was an open air covered lounging deck where we took our siestas and drank our sun-downers. The middle level was the main living level, with the dining room, galley, bar and a huge lounge (that didn't get used much). Down below had the "suite" (the only room with a double bed, which the Swiss took) and 4 other double cabins (unused for this trip), the engine room (2 big V8 drive engines and 2 110v generator sets), and the crews quarters aft. Two big dinghies, each capable of carrying all 9 of us plus a couple crew, were carried in davits on each side. We boarded them via a big swim platform aft. We were able to keep all our snorkeling gear here as well. And if we had been diving, the dive bottles were braced here, too. Meals were a treat. Breakfast started with juice (usually some variant of "tree tomato", which took some getting used to), fresh fruit, granola, corn-flakes, yogurt, and milk. Then would come the cooked main course (omelets, pancakes, etc.) and fresh warm bread with sliced cheeses, jam and cold cuts, and, of course, tea and coffee. 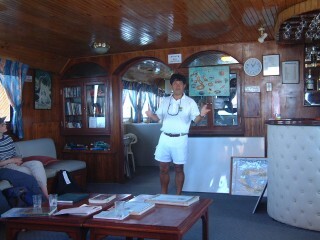 Then we'd board the dinghy and head for our shore excursion with our English speaking naturalist/guide, Rodrigo. After a couple hours of walking and explanations of the animals and vegetation, we'd usually go for a snorkel. Returning to the boat we'd find a snack laid out (pigs in blankets with a mustard sauce, or juice, cookies, crackers and peanuts, etc.). Then we'd go shower off (love that hot water) and rinse our gear (we'd rented wet-suits because the water's chilly). Lunch would start at noon with an excellent soup, followed by what I'd call a dinner: rice or pasta, a meat course, 2 vegetable/salad dishes (both garnished) and some fruit for desert. Tony and I would add a couple bottles of $2 beer. 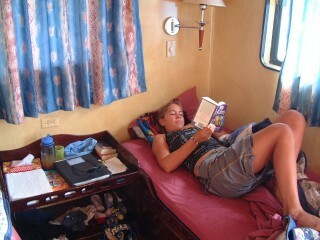 Then we had an hour or so digestion/siesta up on the upper-aft deck. During lunch the crew would move the boat to our next destination. At 2 we'd head ashore again for another walking excursion, followed by another snorkel and then another snack on the boat. Drinks were fairly expensive, so we brought our own rum and a couple of fruit syrups. I'd mix up a pitcher of "rum and (whatever)" about 5:30 and we'd watch the sun go down from our covered lounge while the crew moved the boat to our next destination. Before dinner, our guide would collect us in the forward lounge to discuss the day and what we'd be doing and seeing the next day. Then we'd have dinner - much like lunch except that it came with a real desert. We'd brought a couple of wines from Ocelot to wash it down. The meals weren't gourmet, but they were elegant, filling, nicely prepared, and everything was garnished. Best of all, we didn't have to cook or clean up afterwards - my definition of a gourmet meal! The trips ashore were entertaining and instructional, and although Tony, being a Wildlife Biologist, sometimes knew more than our guide, he also saw and learned a lot. We climbed 1 volcano for some stunning views, and walked on the new (well, 103 years old) lava of another. We saw loads of sea-lions, black Marine Iguanas, yellow Land Iguanas, Blue-footed Boobies, Shear-waters, Pelicans, Frigate birds, and bright orange Sally-Lightfoot crabs. Tony and Sue each added several new birds every day (including penguins!) and we took almost 400 digital photos. There aren't any corals to speak of, but there are lots of fish, including some 6' White-Tipped sharks to snorkel with. But the most fun was swimming with the sea-lions. They just love to play, especially the young and the females. They'd swim loops around us, over and under, and blow bubbles at us. One even nipped at Tony's flipper. Another found a dead sand-dollar and started playing catch with it, rolling it around his body as it slowly sank, then picking it up in his teeth to bring it up to do again (unless his friend stole it, which started a game of Chase). The sharks and rays weren't so playful, but the turtles didn't seem to mind us, slowly swimming along as we circled and Tony tried for better photos. We'll probably stay here for a few more days, leaving towards the end of the week for Isabela, the biggest island about 40 miles west of us. There we want to ride some horses up to see the huge tortoises in the volcanic craters, but that will only take a day or so. 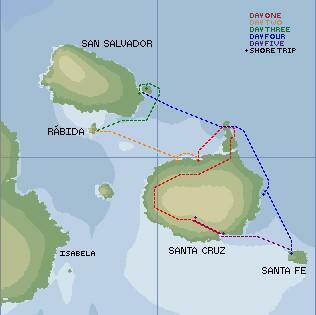 Early the next week we want to head out for the Marquesas, a 20-30 day sail to French Polynesia. Click here to go the other Galapagos Tour page (not just our newsletter) for more information and to see another photo gallery. You may also want to see the Galapagos Flora and Fauna and Galapagos Birds pages.